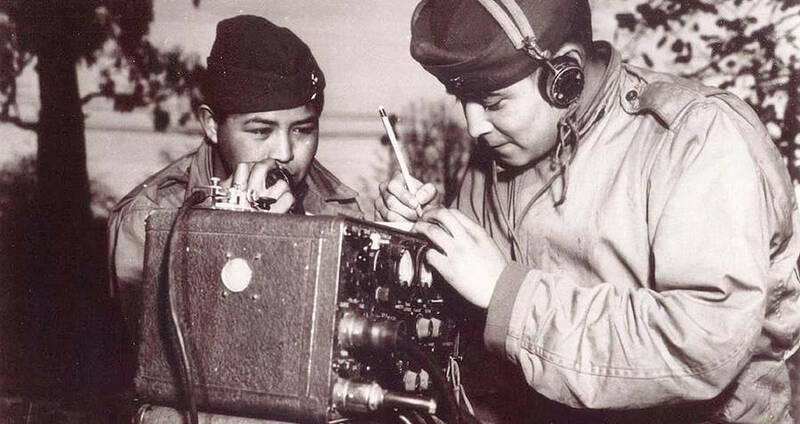 To this day, the Navajo code talkers' language remains the only unbreakable code ever used by the Marine Corps. 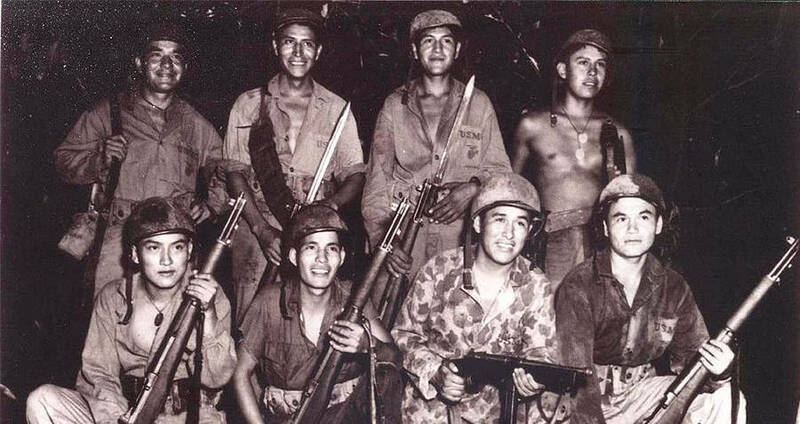 Navajo code talkers posing during World War II. The Navajo language is a complex beast, even for those who have grown up speaking it. Words, depending on their inflections when spoken, can have up to four different meanings, and the verb tenses are near-impossible to decipher. Until the late 20th century, the language didn’t even have an alphabet and didn’t exist anywhere in a written form. For all intents and purposes, Navajo was an incomprehensible language to anyone outside of the small pocket of southwestern American people who spoke it. However, that was exactly what made it the perfect candidate for a wartime code. National ArchivesCpl. Henry Bake, Jr., and Pfc. George H. Kirk, Navajos serving in December of 1943 with a Marine Corps signal unit, operate a portable radio set in a clearing that they have hacked in the dense jungle behind the front lines. In 1942, the Allies were pressed in both theatres of World War II. France had been taken over and England was still struggling to cope with the effects of the Blitz. Communication between Allied soldiers was becoming difficult, as the Japanese were becoming better at breaking the codes used by their enemies. It seemed that almost every form of communication had some sort of flaw. However, Philip Johnston thought otherwise. Johnston was a civil engineer from Los Angeles, who had read about the issues that the United States was having with military security and finding an unbreakable code. Being the son of missionaries, Johnston had grown up on the Navajo Reservation, which stretches between New Mexico and Arizona. He had also grown up speaking Navajo. Immediately he knew it was exactly what the government needed. After thinking through his idea, Johnson visited U.S. Marine Corps Camp Elliot in San Diego. Though at 50 he was too old to fight in the war, he was determined to lend his services in any way he could. At Camp Elliot, he met with Signal Corp Communications Officer Lieutenant Colonel James E. Jones, who he convinced to let him demonstrate how his code idea could be effective. 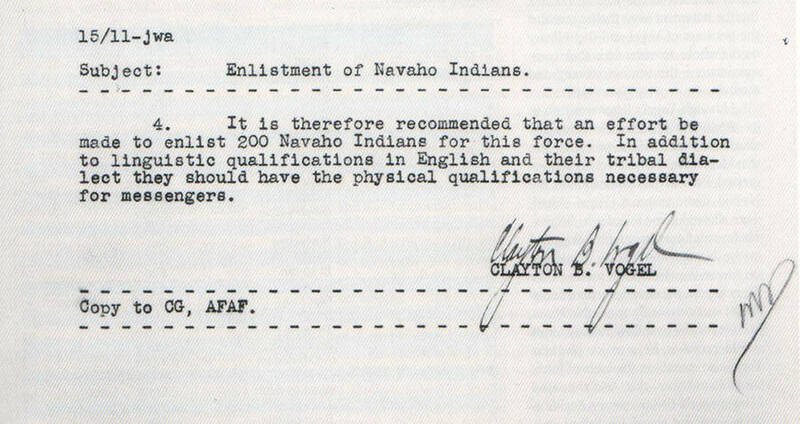 Wikimedia CommonsA Navajo code talker enlistment letter. Though the marine officers were skeptical, they eventually agreed to hear Johnston out and promised that they would observe a test run of the code if he could organize it. So, Johnston went back to Los Angeles and rounded up his troops. He managed to recruit four bilingual Navajo men for his demonstration and on Feb. 28, 1942, brought them back to Camp Elliot for a demonstration. The marine officers split the Navajo men into pairs, placing them in separate rooms. Their task was simple, to give a message in English, to one pair of Navajo, and have it sent to the other pair for retranslation. To the amazement of the marine officers, the message was accurately translated, and in record time. Immediately Camp Elliot commander Major General Clayton Vogel sent a message to the Marine Corps Headquarters in Washington D.C. In his message, he requested approval to recruit 200 young, well-educated Navajo men to be Marine communications specialists. Though the government only approved the recruitment of 30 men, they ultimately accepted the plan. Before long, Marine Corps personnel were actively recruiting young men from the Navajo Reservation. 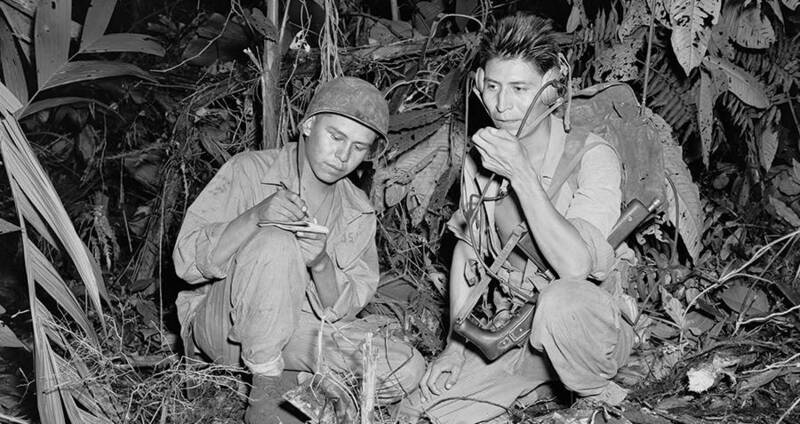 Navajo code talkers working in the field. As much as the experience had been new for the Marine Corps, it was nothing compared to the way that the Navajo recruits felt. Before the arrival of the recruiters, most of the Navajo people had never left the reservation – some of them had never even seen a bus or train, let alone ridden on one. Even more of a change was the highly regimented lifestyle that came along with enlistment in the Marine Corps. The discipline was unlike anything they had ever seen, and the expectation that they would obey orders, march in line, and keep their quarters clean at all times took time for the recruits to adjust to. Before long, however, they settled in and got to work. Their first task was simple; to create a simple, easy to remember code in their language that would be impossible to break if overheard by enemy listeners. Before long, the recruits had developed a two-part code. 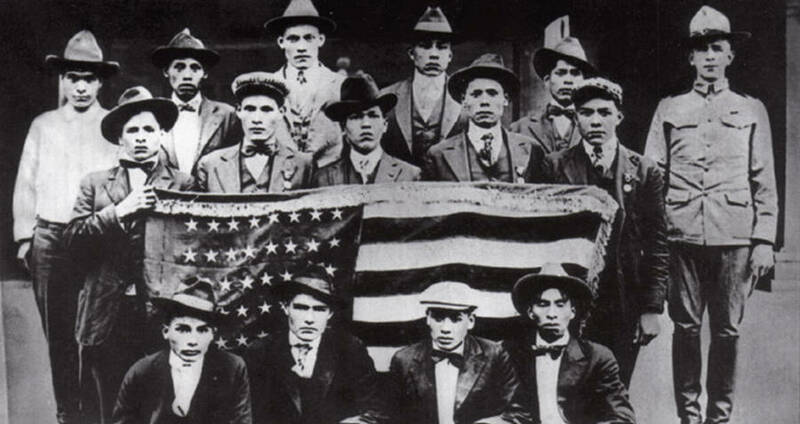 National ArchivesNavajo code talkers upon returning from the war. The first part was written as a 26-letter phonetic alphabet. Each letter would represent the Navajo names for 18 animals, as well as the words “ice,” “nut,” “quiver,” “ute,” “victor,” “cross,” “yucca,” and “zinc,” as there was no Navajo word for animals that began with the letters they represented. The second part involved a 211-word list of English words that had simple Navajo synonyms. Unlike conventional military codes, which were long and complicated and had to be written out and transmitted to someone who would have to spend hours decoding it on electronic equipment, the Navajo code’s brilliance lay in its simplicity. The code relied solely on the sender’s mouth and the receiver’s ears and took much less time to decipher. Furthermore, the code had another advantage. Because the Navajo vocabulary words and their English counterparts had been picked at random, even someone who managed to learn Navajo couldn’t break the code, as they would only see a list of seemingly-meaningless Navajo words. 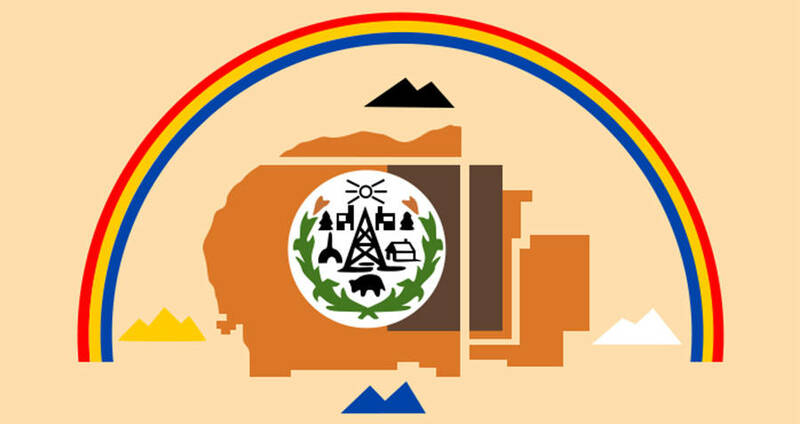 Wikimedia CommonsThe flag of the Navajo nation. By August of 1942, the Navajo code talkers were ready for combat and reported to Guadalcanal to serve under Major General Alexander Vandegrift. Within days Vandergrift was blown away by the efficiency of the code talkers, and had written to headquarters to ask for 83 more. By the next year, the Marine Corps had almost 200 Navajo code talkers in their employ. While their code talking became invaluable in many aspects of war, the Navajo code talkers got their shining moment during the Battle of Iwo Jima. For two days straight, six Navajo code talkers worked around the clock, sending and receiving over 800 messages – all of them without error. Navajo code talkers were used through the end of the war, and by the time the Japanese surrendered, the Marines had enlisted 421 code talkers. Most of them had enjoyed their time and their service to their country and continued to work as communication specialists for the Marines. In 1971, the Navajo code talkers were awarded a certificate of appreciation by President Richard Nixon for their patriotism, resourcefulness, and courage in battle. To this day, the Navajo code talkers’ language remains the only unbreakable code ever used by the Marine Corps. After learning about the Navajo code talkers contributions during World War II, check out these heart-stopping photos from World War II. Then, read about Calvin Graham, World War II’s youngest decorated soldier.